When Germany invaded Vilna in July 1941, the Lithuanian police systematically combed through Jewish neighborhoods, grabbing young men from their homes, executing them and tossing their corpses into the massive graves of Ponary. The Levin family residence proved disappointing to the collaborators as Chaim Levin and his family -- including Benjamin, a plucky fourteen year old with a "wild streak", and his older brother Shmuel, a serious young man with an intense personality -- were not at home when the bombs fell. Benjamin Levin spent the pre-war days running around the streets with a youth gang, and knowing the neighborhoods, managed to avoid the marauding invaders in the first weeks of occupation. His older brother and father had already fled the city for the nearby village of Mihailishuk. The well-connected family had been tipped off by friends, allowing the remaining members to flee the village before the Vilna ghetto was erected. Their network of associates saved them more than once from subsequent deportations and executions -- even after they returned to Vilna, during a period of relative calm. 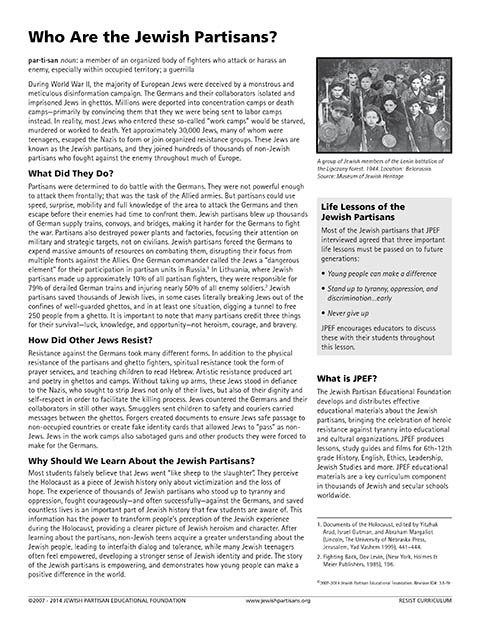 Shmuel was involved with various political youth organizations, and strongly advocated for armed resistance against the Germans. He even used the family's savings to purchase guns for the cause. Fed up with indecisiveness among the ranks, he eventually left Vilna to join the partisans. As the pogroms and the violence continued, in autumn of 1943 Chaim again decided that it was not safe to remain in Vilna. With his encouragement, Benjamin fled the ghetto with a group of other young Jews, and went to the woods to join his brother. Unfortunately, his brother was killed during a mission just a day before Benjamin's arrival. Sadly, his parents did not survive to see Vilna liberated either. While hiding in a forest house they were killed by a greedy janitor. 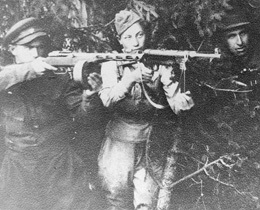 Benjamin and his group joined a brigade of partisan fighters, Jews, Russians, Poles and Lithuanians, under the leadership of Batya, an old forester whose expert knowledge kept the city boys alive in the swamps. 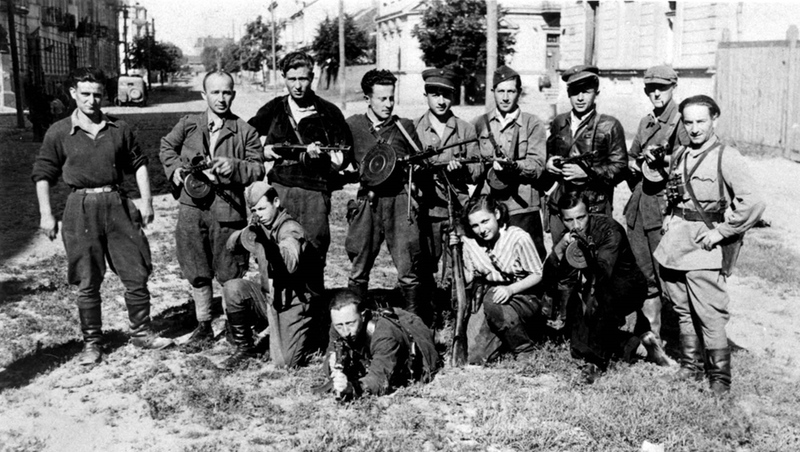 Eventually, other survivors from the ghetto's 'liquidation' -- including the remaining members of the FPO (United Partisan Organization) -- joined them. Under the Kremlin's complicated hierarchy for managing resistance campaigns, the group was eventually incorporated into other partisan brigades. Benjamin's youth, and aversion to politics, kept him safe from purges and factional strife within the ranks, which cost others their lives. Although young, Benjamin's knowledge of the forests, and his expertise with customs of the local peasants, made him a valuable asset on food raids and missions to gather essential supplies and ammunition, and to destroy bridges. He survived to see Vilna liberated, and after many hardships -- including imprisonment by the NKVD -- he migrated to Israel, where he married and had two children. He currently resides in Ossining, NY.